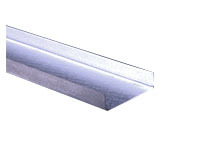 Features: Embossed track spacing for faster, more accurate installation. Stiffening ribs provide additional strength and rigidity. Deep knurling dimple embossing allows for rapid screw connections.